Our first Christmas in the U.S. since 2010 was a rousing good time and memorable for the people, the food, and the snow. (We have tried to forget the five hour flight delay in Denver.) We passed the holidays at about 7400 feet above sea level in Durango, CO, with my brother Rick and sister-in-law Jane. We visited with a vast assortment of their friends and extended family. Derek was along, too, so we’ve managed to have two major U.S. holidays together in the 60 days since we returned from Italy. 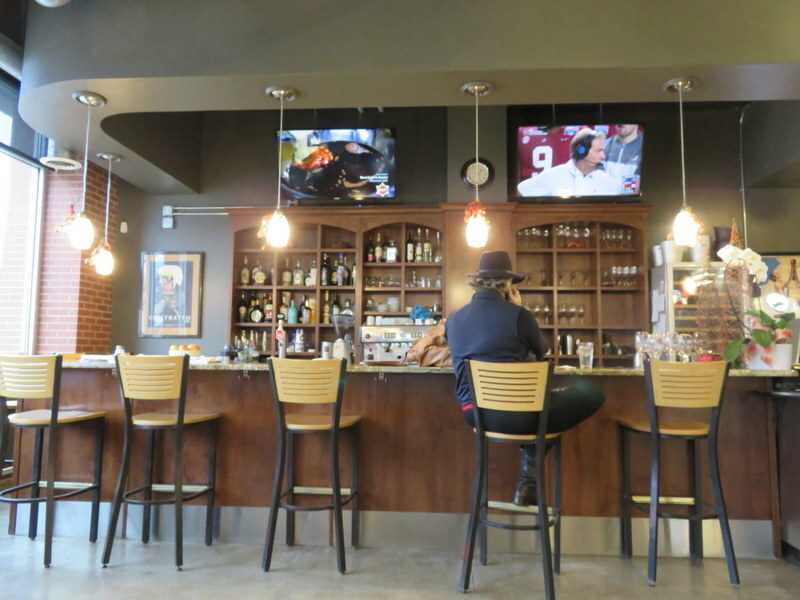 A few barstools define one end of the room. Great wine selections. We had one memorable meal after the other. Roast turkey, prime rib of beef, duck, salmon, lamb, Swedish pancakes, grilled filet, salume, rafts of mashed potatoes, huge fresh salads, all accompanied by fine wines and the best Scotch whiskey. Rick and Jane know how to entertain. AND there was pizza to wrap up the 10-day visit. 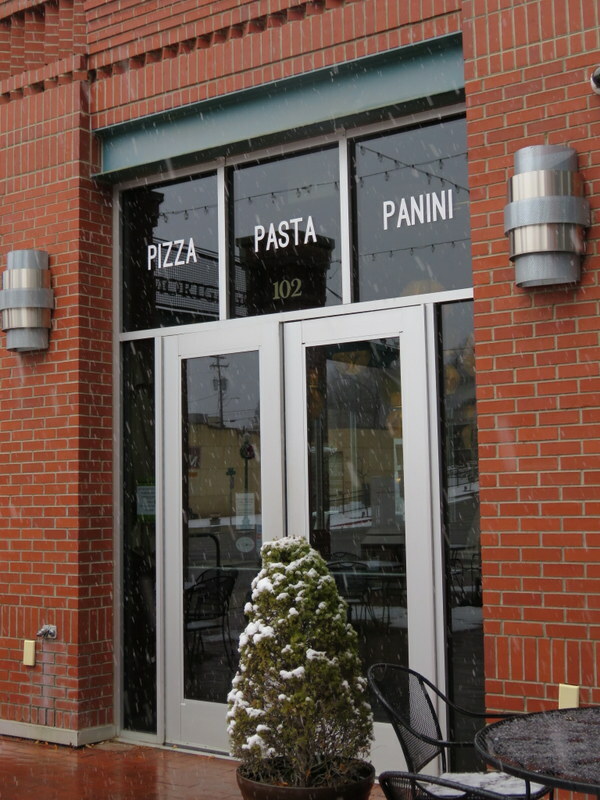 Guido’s Pizza Pasta Panini is a little oasis of Italian delights high in the Rocky Mountains. We’ve shared a few meals at Guido’s during our Durango visits. The owners trained in Italy, speak Italian, import their salume e formaggi from Italy (to the degree the law allows), and sell beautiful Italian products in their little mercato. Now there is pizza, new since our 2014 visit, so we had to try it. What better send-off for a long travel day than a fine pizza? A classic Diavola has only spicy salami. I added arugula, one of the add-on choices. The snow was keeping the crowds at bay, plus Guido’s is located a couple of blocks away from the main tourist area, so it was not deluged this New Year’s Eve. We waltzed in and were seated immediately. 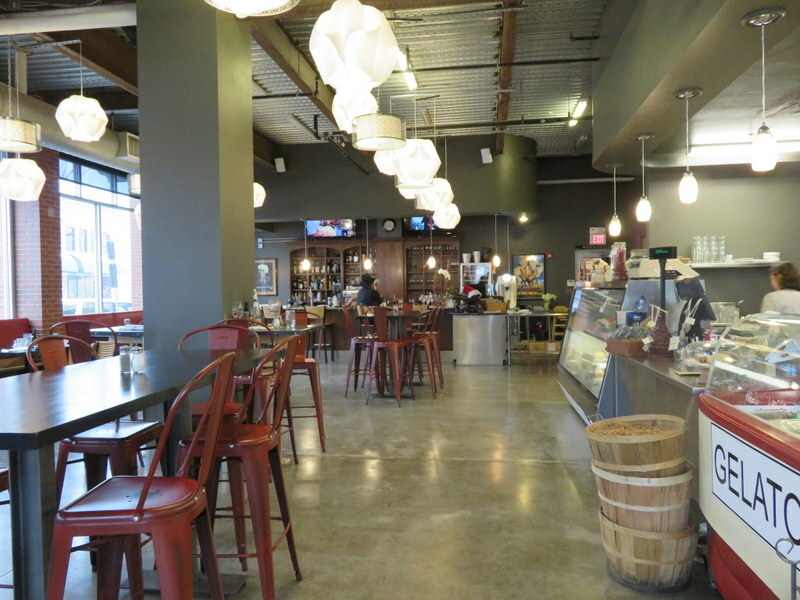 The restaurant is fairly large, perhaps a bit industrial-modern, but the tables are not crowded together. There’s a lot of food available for home use, from beautiful cheeses and Italian-imported salume to canned goods and pasta made in Italy. Two of our party ordered the funghi, a simple pizza that can be problematic with moisture. The crust stood up to the challenge. The addition of optional anchovies gave a flavor contrast. 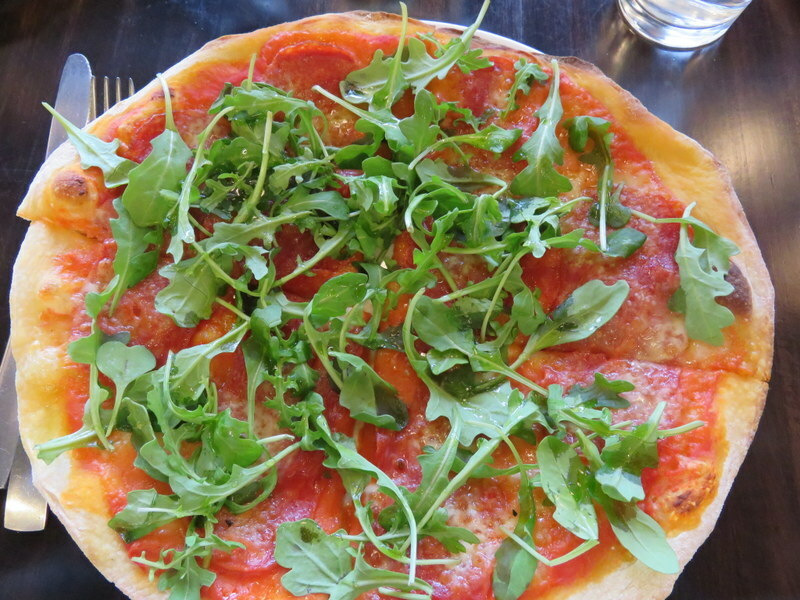 We came for pizza and fine pizza it is; Roman-style, featuring a thin crust and high-quality ingredients. San Marzano tomatoes form the base, and the mozzarella is melty and gooey like in Italy. Although the topping choices are limited, they are fresh and delicious. As with an Italian pizza, Guido’s does not pile on the groceries. Ingredients are judiciously applied. The result is a balance of flavor and a crust that stands up to the toppings retaining its tenderness without becoming soggy. The only thing missing is the flavor from a wood-fired oven, which in the U.S. seems to be a difficult-to-find option. 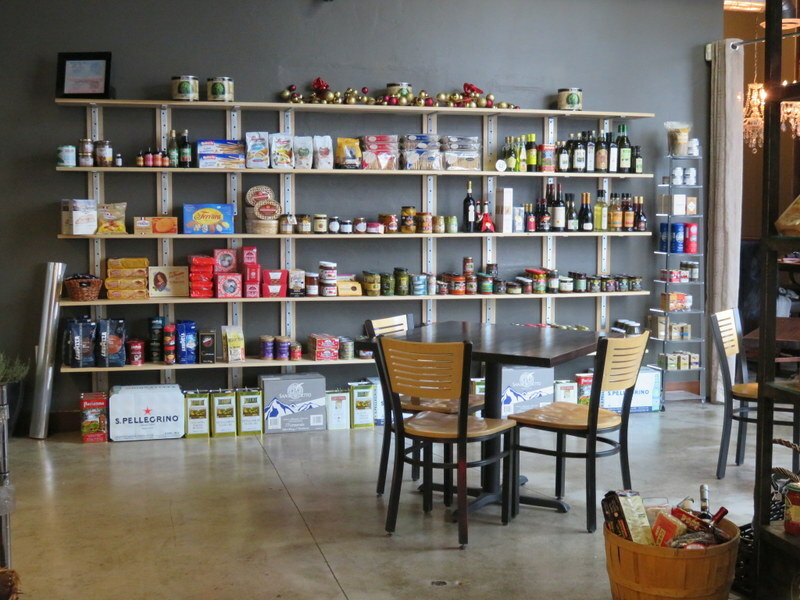 One side of the store offers (mostly) Italian products. The pizzas are a tiny bit smaller than those served for dinner in Italy. However, I could seldom eat the whole thing in Italy, leaving extra for Ric. At Guido’s I ate it all. Hmm, maybe that’s not a good thing. In addition to the New Year’s Eve pizza, we had lunch at Guido’s on Christmas Eve. The panini enjoyed by Rick and Derek were hearty and reported as tasty. They looked fabulous. My Ric enjoyed a large salad called the Ghiottone (the Glutton). With the prospect of Christmas Even dinner, I wimped out and chose the smoked salmon carpaccio. It was an excellent choice along with a glass of Verdicchio. Say formaggio! 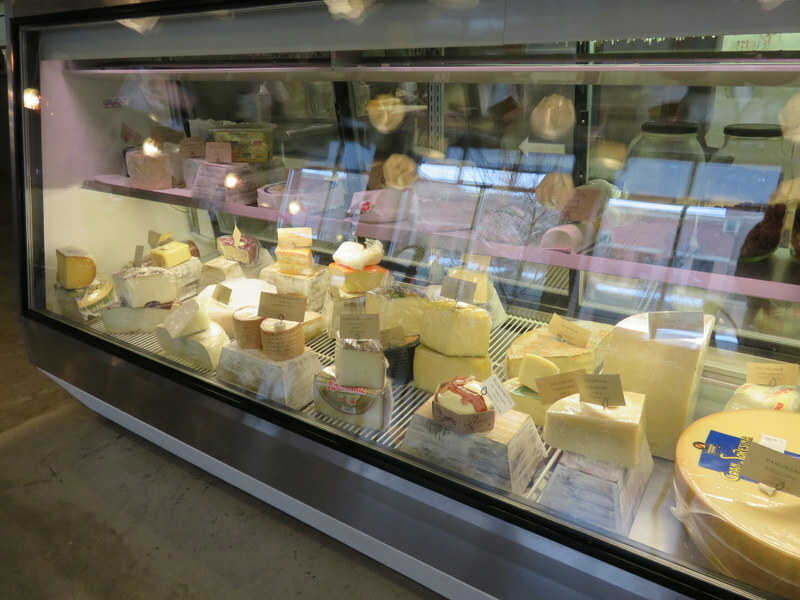 Too bad about the reflections but trust me, the cheese selections are awesome. While it is not Da Remo, La Pratolina, nor Dar Poeta, it is decidedly excellent and Italian-style. We would eat here again in a heartbeat. Maybe next Christmas if we are invited back. Pizza Quality: 3 Few choices of toppings, but each pie is carefully crafted. 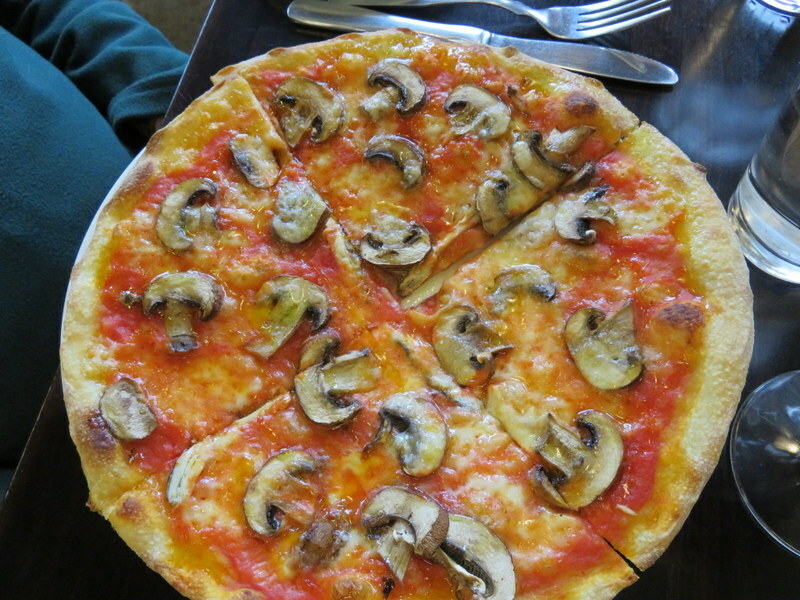 You can add ingredients selectively but not load-it-up like an American pizza. Each ingredient thus stands out. Service: 3 Efficient, friendly, and casual, as would expect in a small Western town. Everyone knows everyone that lives here. The owner is present much of the time and makes a point to stop by the table. Ambiance: 2 The atmosphere is a bit industrial for my taste, a cavernous room without much warmth, located in an office building. 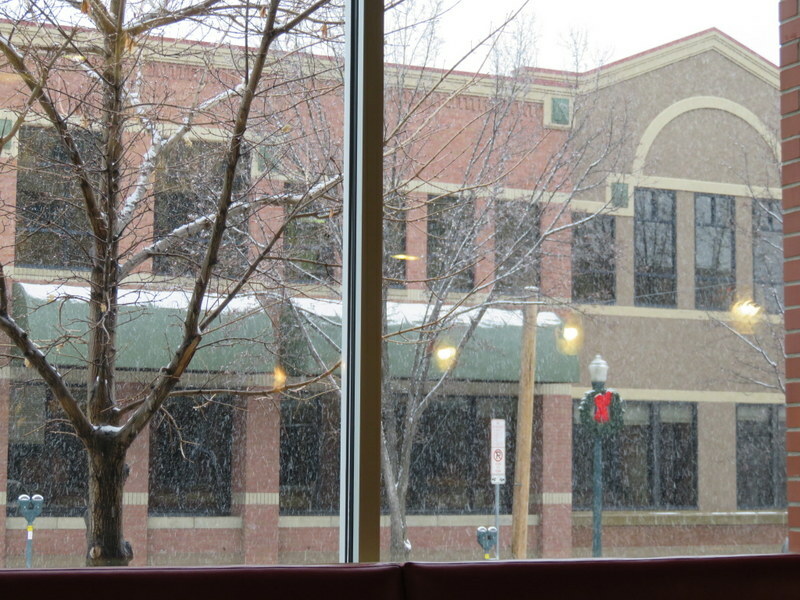 There are great windows that allowed us a view of the falling snow and in summer a patio out front. Bonus: 1 Extra credit for Italian products and other menu items. Returnability: The Best! Absolutely go here if you are in Durango. Large windows allowed us to watch the falling snow. The room is big, but they have resisted the urge to cram it full of tables.